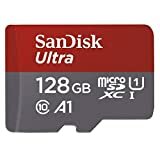 Did you miss out on Amazon’s huge sale last week that slashed the Sandisk Ultra 128GB Micro SDXC UHS-I Card with Adapter to its lowest price ever? Well don’t worry because the best-selling microSD card on Amazon’s entire website is back under $23 on Wednesday. As is always the case with SanDisk microSD card sales, there’s no telling when this deal will sell out so you had better hurry. And if you need more space, you can snag a 256GB SanDisk card for just $59.99 today.